What do you get when you combine a shotgun, a machete, and a good zombie call with an intrepid but extremely bored female survivor? 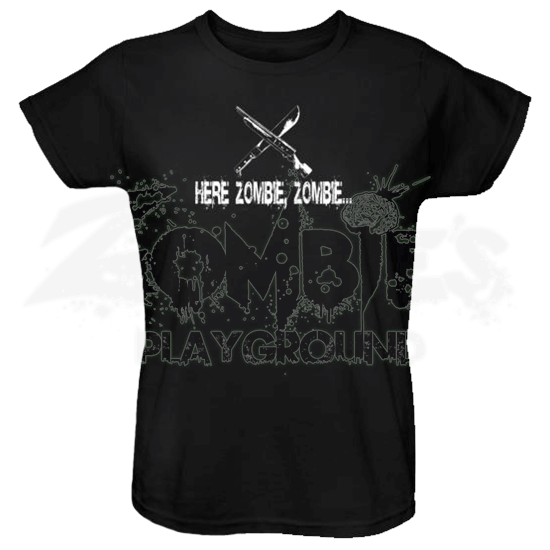 For one, you get a lot of dead zombies that will not get up ever again, and you also get the Womens Zombie Lure T-Shirt. This black t-shirt is made from comfortable materials and features simple white lettering, leaving it blessedly uncluttered and rather straight-forward. Crossed over the chest of the shirt are a classic machete and a shotgun, both of which happen to be classic zombie killing weapons. Beneath the two weapons are the words Here Zombie, Here , which might be the call you could hear from a bored survivor or zombie hunter as they seek to either vent their frustrations, alleviate boredom, or just thin the zombie heard. This shirt features a standard womens fit and is made from quality 100% cotton. Zombies may have the numbers and undead endurance, but humans still have tenacity. The Womens Zombie Lure T-Shirt is a great shirt to wear, whether you are actually out hunting zombies or if you are just out and about on any given day.